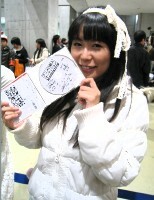 Comic Market 75 took place on December 28 to 30, 2008. I went on 12/28, to visit the D-Age booth and look around the corporate booths. Since I wasn't planning on taking many pictures, I only brought my IXY Digital 910IS compact camera. I arrived at around 13:00 and stayed until a little after 16:00. Itou Asuka The three girls from the animelo audition (Itou Asuka, Wakabayashi Yuki, Kariya Rimoko) were at the D-Age booth selling the CD Animelo Shinjin Audition -Memorial Songs-. They had a signing session from 10:30 to 12:30. After this event, the girls were at the booth passing out flyers until around 16:00. Since I arrived around 13:00, I had missed the signing session, but they girls signed the CD for people who bought the CD. 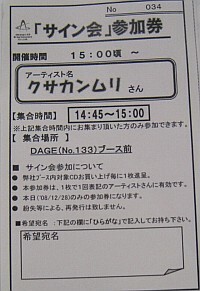 Also at the D-Age booth, the group Kusakanmuri had an event for their latest CD Choco Mint, (from 15:00 to 16:00). The first part of the event was a talk by Kaya (the lead singer) and K-sugi (the producer). The second part was a signing and handshake session with all four members of Kusakanmuri. For the event, the girls had pre-signed a CD sized board, and they wrote individual comments on the back of the board. There were around 30 people for this event. No photos allowed at this event. 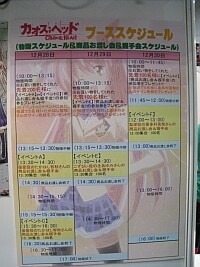 At the Chaos; Head booth, Takahashi Chiaki had a couple events. They were crowded and I couldn't get close. But when I went to the booth at around 16:00, there weren't that many people around and they weren't stopping people from taking pictures during the janken session at the end.